For the visitors to Kenya the incredible diversity of landscapes, cultures, wildlife and activities give endless opportunities to explore more, to feel more and to have more. Famous for its world-famous national parks and wildlife safaris, Kenya is a heaven for wildlife lovers. With wide range of animal habitats, all within relatively close proximity to one another, the country has got excellent infrastructure for local travel. In Kenya, with more than 45 National Parks and reserves, one can experience a different kind of safari every day and Kenya tours and safaris are incomplete without including visit to any of the national parks like Maasai Mara National Reserve, Mount Kenya National Park, Lake Nakuru National Park, Aberdare National Park, Amboseli National Park, etc. and one can locate the Africa’s big 5 in almost all these parks and reserves very easily. With activities including visits to these world famous wildlife parks you can hand feed Giraffes, adopt an orphaned elephant, take a balloon safari in early morning or during the dawn or just relax at some wildlife resort in Kenya. Team Plan Journeys offers great deals and offers on Kenya tour packages. Our Kenya packages cover the best destinations, which Kenya offers to the world. Nairobi is not only the bustling capital city of Kenya but also serves as the main entrance point to almost all tour packages to Kenya. 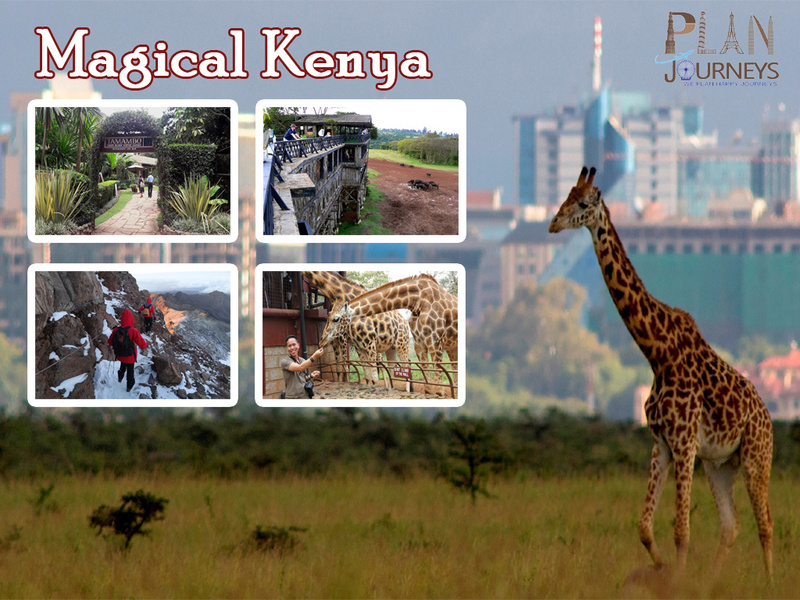 With attractions like Nairobi National Park, National Museum, Elephant Orphanage,etc. the city of Nairobi itself is a travel destination and travelers love to stay here for two to three nights during their trip to Kenya. Wildlife enthusiasts enjoy the beautiful scenery offered by Mount Kenya National Park – one of the 6 world heritage sites in Kenya, is also home to the Mount Kenya – the second highest peak in Africa and an extinct volcano. 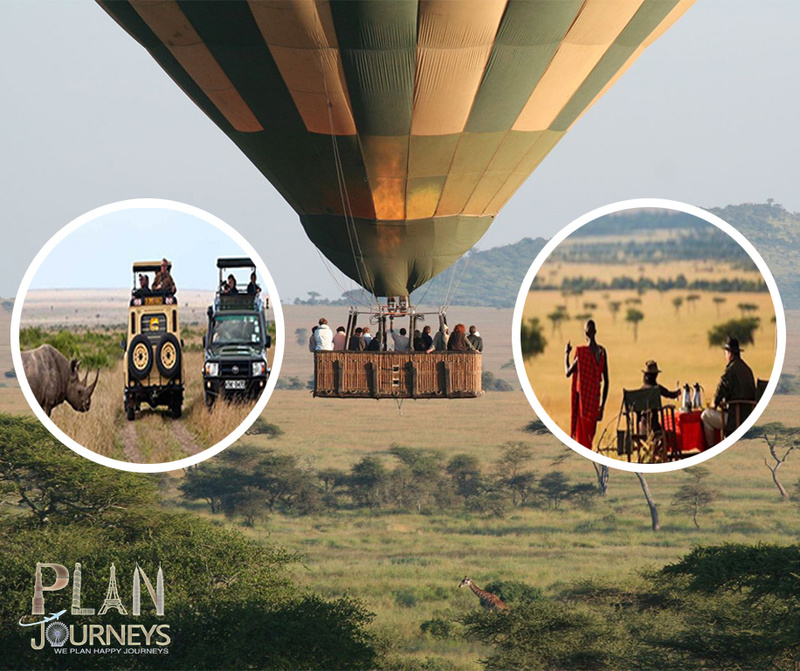 Maasai Mara National Reserve is another great destination and one of the most famous wildlife habitats in the world and offers many activities like Balloon safaris, walking safaris, game drives, etc. Close to Nairobi, Lake Nakuru is one of the Kenya’s best national parks. Explore the forested areas below the Flamingo hill here, which is the best lion-spotting point. * Guaranteed window seat in the vehicle. * Game viewing drives as stipulated in the itinerary. Guaranteed window seat in the vehicle. Game viewing drives as stipulated in the itinerary. For wildlife lovers planjourneys.com designs the best travel packages to Kenya. With great research work and rigorous training sessions, we make sure that never miss a single spot while planning your vacations to Kenya. You may be traveling for few days or interested in a long wildlife tour package, Kenya travel package is suitable for everyone. To book world’s best safari tour and wildlife packages contact Plan Journeys’ travel expert and get the best offers on Kenya tour packages. World’s best safari tour packages in Kenya, starting from 3 nights up to 10 nights. Services of experienced safari driver guide during your Kenya wildlife safari visit. Complimentary travel and health insurance from Plan Journeys for your trip. Wide range of accommodation in Kenya, so that every budget can fit in. Comfortable safari vehicle so that you can enjoy your safari tours. National Parks and reserves entrance fees. Please check out our Kenya travel itineraries and get in touch with our operation department for more information on customized Kenya holiday packages.